You’ll be surprised how simple these are to prepare and how melt in your mouth delicious they are. 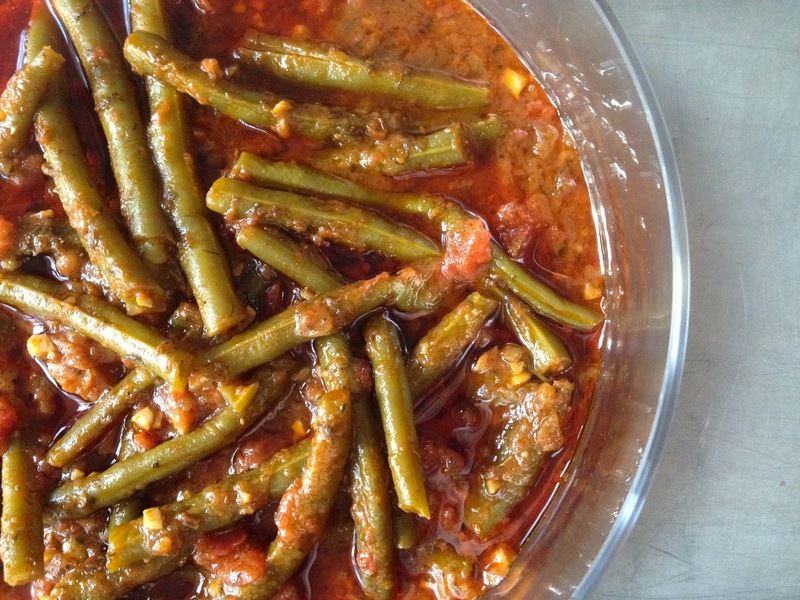 This recipe is based on 2 lbs of green beans and can easily be doubled or tripled with perfect results. Make sure to have a good piece of bread on hand to sop up the sauce. Get ready to wipe the dish clean! 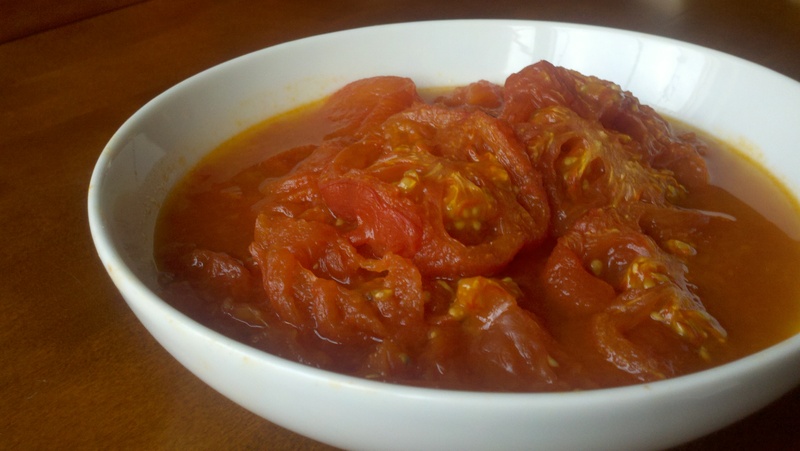 This is a good recipe to use roasted tomatoes. If you’re using canned Muir Glen is my favorite brand as they’re organic and fire roasted, so full of great tomato flavor. Remember to mince the onions and garlic as finely as you can. By the time the beans are done, they will have almost melted into the sauce. It’s important not to rush the cooking time here. The longer and slower you simmer your beans, the more amazingly tender and delicious they’ll be. Patience really should be listed with the ingredients! Serve these beans over skordalia (Greek garlic mashed potatoes) for an amazing, hearty, healthy dinner or in a crusty fresh bread bowl for a fun, delicious twist. Wash and trim off ends of green beans. Heat olive oil and gently cook onion and garlic to heavy bottomed saucepan. Add water or vegetable broth, tomatoes, 2 tbsp tomato paste in 1/4 cup warm water and spices, stir well and bring up to a simmer. Add green beans, stir and bring to low simmer. Cover and cook for 50-60 minutes. Allow the beans to sit for 10-15 minutes after removing pan from the heat. Serve hot with a piece of crusty bread and enjoy! This recipe serves 4 as a main dish and 6-8 as a side. Truth be told I almost always at least double this recipe as leftovers are amazing! And this is not a paid plug – I love them and know you will too! made these last night. they were every bit as good as you describe. thanks so much for the recipe. Thanks for this recipe – delish! I also use frozen beans (whole baby beans work best) if I can’t get fresh beans. Can you substitute something for the dill? Not a favorite flavor of mine. Rest looks great. Thanks! Perhaps use just oregano and leave out the dill? I think that might work just fine, though I do love dill myself 🙂 Let me know how it turns out! I use fresh flat parsley instead of dill. I was taught to cook with a handful of finely chopped fresh parsley, S&P (and a little sugar depending on your tomatoes) – doesn’t need anything else! no dill, oregano or cinnamon. Add 2-3 chopped potatoes to the mix to round out a meal. And serve with feta and crusty bread to mop up the sauce! I love dill in this dish but hubby can’t eat it. I sub parsley and mint, no cinnamon. Yum!! Efxaristo! This makes me happy to be a Greek Vegan! I just made it and I’m in love! I see vegetable broth in the cooking instructions, but not listed as one of the ingredients. How much is needed for this recipe? and Dad was Cretean! No dill in the beans just oregano! How about fresh mint instead of oregano and dill…. I am married to a Greek, and have learned many Greek dishes from my mother-in-law from Crete. I had forgotten my proportions for Fasolakia (this recipe) and used this recipe as a base. A couple of tips… 1) I have only seen this served with chopped potatos cooked into it – add 2-3 med chopped potatoes maybe 15 mins into cooking time so they don’t get too mushy. So no side dish necessary – just serve with a fresh baguette! (and some feta if you aren’t vegan)…. 2) I would add boiling water at the end of prep, and add enough to cover and a bit the beans (maybe 2 1/2 cups). You want this saucy not soupy….. 3) I have never tried it with dill, cinnamon & oregano – must be a regional thing! I have been taught to only add S&P, a spoon of sugar if not using fresh summer tomatoes, and a handful of chopped parsley – maybe 3 Tbs?. Also I would leave it at 3 garlic cloves. 4) Don’t be scared of the oil, it makes the dish!! My Mom also added cut up potatoes. Another add in she used was zucchini cut into about 2 inch long pieces. She would add them towards the end of cooking, since the zucchini cooks quickly and you don’t want it to disintegrate. SO good! OH I love this!!! I have had these at Greek restaurants and always loved them!!! So glad I now know how to make them 🙂 Pinning and making next week!!! Thank you! We always served it with cold feta crumbled on top at the table and crusty bread. 2. I feel as though even if it had turned out, do you ever get the feeling that the produce in Greece is just…BETTER than in the US? I dunno…I think there’s more to it than just good cooking, because good cooking can’t make, for example, a courgette taste MORE like a courgette! Thanks for everything you do! Oh, and if I may make a request: there were some sort of intensely sour stuffed artichokes I had. If you have any clue what they may have been (they were vegan! ), or those divine eggplants in a tomato sauce, it sure would make MY day, anyway! I had the same experience growing up!! I was completely shocked! I love how these can be served so many different ways. Happy to find your blog, too! Love this!!!! Left it for another 10mins reducing though. Next time will add some fresh chill too. Amazing dish! Love your recipes! These are things I grew up eating too. Mine ended up very soupy. Any ideas what I did wrong? I made it again tonight (finally) and it was PERFECT! Thank you! I used vegetable broth, but I didn’t add dill or cinnamon, because I wanted my 12-year-old to try it, and I know he doesn’t like cinnamon and I don’t think he will like dill. (I love both flavors, but he is very picky.) Well, he loved it! I’ve been trying to get him to eat more vegetables. He likes only potatoes and occasionally broccoli, so now we have added green beans to the mix. Thank you for a great recipe! Part of being Greek is adding your own twist to nearly every recipe 🙂 I made according to your recipe as I wanted the experience it….Delicious! I just woke up and read this recipe, funny how at 9 o’clock in the morning I’m craving green beans. I think a trip to the store today it’s in line for me. Thanks for sharing this recipe. With tomatoes, green beans are tasty, nice recipe. Greeks know how to cook well, and your recipe is awesome. I can’t stop making these because we can’t stop eating them! I added pearl mushrooms this time, SO ADDICTIVE! I have just come back to Australia after holidaying in Greece, I had the Greek Beans. Amazing flavour, also tried similar with peas & carrots, I can’t wait to get over this jet lag and cook some Greek Food. jealous of your green bean harvest!